Eldest attends a Church of England school and so yesterday, to mark Christmas and the end of term, they held their Christingle service in the beautiful church dating from the 12th Century which is attached to the school. All of the children made Christingles and proudly took them into Church. They had great fun lighting them and stood throughout the church proudly holding their candles. It was really lovely to see all of the children singing "Away in a Manger" holding their Christingles and they couldn't wait to eat their sweets as soon as they were finished! Eldest has gone over in great detail with me about the meaning of Christingles and how she made her Christingle, so I thought I would share it with you. 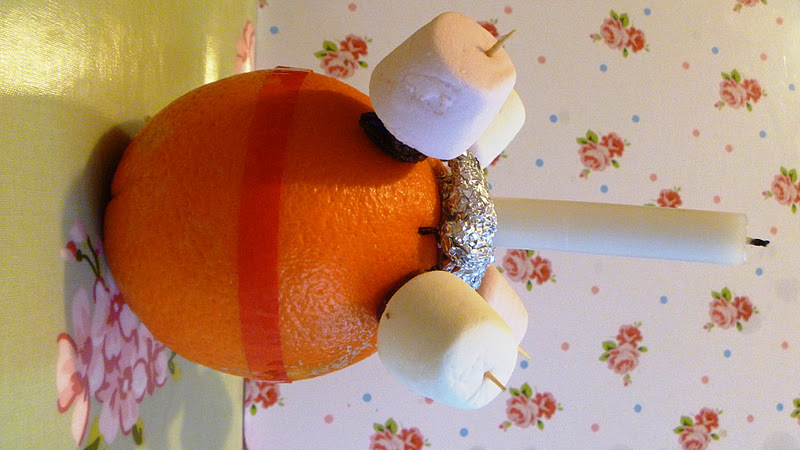 Christingle means "Christ's Light" and is a symbol of the Christian Faith. Many churches will hold Christingle services around Christmas, a tradition from the Moravian Church in Germany dating back to 1747. The Anglican Church of England introduced giving out lit candles or Christingles in 1968. Different components make up a Christingle and each part had a different meaning. The orange represents the world, and the candle represents Jesus as the light of the world. The red ribbon or tape which goes around the orange represents the blood of Jesus and reminds Christians of Jesus' sacrifice on the cross. There are four cocktail sticks which either represent the four corners or the four seasons of the world. The sweets or dried fruit symbolise God's goodness and gifts to us and also suggest that he "feeds" us physically and spiritually. Take the red tape or ribbon and tie or stick it around the orange. Cover the top of the orange with the foil. Take the pencil and push it through the foil and into the top of the orange to make a small hole for the candle. Carefully push the pencil into the top of the orange to make a small hole. 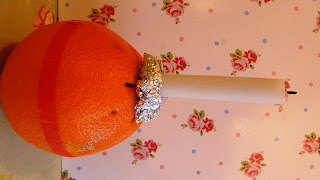 Stick the candle into the top of the orange and make sure it is secure and will not fall out. Thread a few raisins and sweets onto each of the four cocktail sticks. Take the cocktails sticks and push one into each corner of the orange so that they face upwards in opposite directions. Take care when lighting your candle and ask a grown up for help if needs be. Eldest used Dolly Mixtures to make her Christingle but she ate them all before I could take a pic, so we have used marshmallows instead!